Nobody was more surprised than Elizabeth Cleary herself when, at the opening of the 2008 Claremorris Open, curated by Lizzie Carey Thomas of Tate Britain, her name was called out as the winner of the Emerging Artist Award with a very welcome prize of €2,000 for her video piece Archive EC. Cleary had wanted to make a self-portrait without using her face and so she trawled through her large personal archive for objects representing her life, choosing one for each decade.Having a long-standing interest in video, Elizabeth set up two cameras, one at a slight distance from her collection of items, the other close up, and then began to select each piece whilst narrating its significance. For the first decade Elizabeth chose a book of photographs that her father had bought when she was a child, a book full of images of metal constructions, wrought-iron railings and reflections in glass and water.These are things that Cleary constantly photographs herself, so obviously she is still being influenced by things she saw as a child. Continuing up through the decades to her current, eighth decade, she chose a prop from a video she made with her grandchildren recently.The layered, time-lapsed video piece that resulted is more eloquent and revealing than any figurative portrait could ever be and stands as testament to the strength, determination and creativity of a unique Irish artist.In many respects it also tells of a very typical Irish life in the twentieth century, a life lived through many enormous cultural and economic changes.However, it is a life that, although situated in Ireland, in its specificity also speaks of the universal. 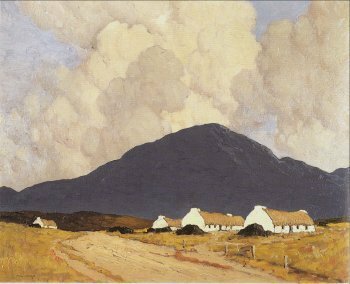 In a recent conversation with the author, Fowler stated that this view was even more true today and, whilst it is always advantageous to live in one of the important global art centres, instantaneous communications now ensure that contemporary artists living in Ireland are most definitely at no disadvantage and their work is broadly indistinguishable in subject and form from their contemporaries in other countries. Despite the presence of some respected names on several visual-culture fronts,Pierce’s group came to no definite conclusions on the question of ‘Irish’ artists / art, which of course it is impossible to do given that the discussion is “not only multi-layered but also without limit.”  Ireland’s multi-cultural population will obviously continue to effect change in both the indiginous and migrant population as time unfolds, resulting perhaps in what Salman Rushdie in Imaginary homelands called ‘hybrids’, “people in whose deepest selves strange fusions occur, unprecedented unions between what they were and where they find themselves.”  In a world of such shifting boundaries and identities, how then could one define categorically an ‘Irish’ or any other nationality of artist? Perhaps the problem needs to be looked at from another angle.As illustrated earlier by Elizabeth Cleary’s obsession with photographing reflections and wrought-iron railings, a concern deeply bound up with her early childhood experience, ‘what they were’ is inextricably linked in people with what they later become and the art they produce from the deep well of lived experience.This universal truth confirms Freud’s theory that “the history of the child’s experiences is never eradicated, it is to be found in the archaeology of the city of the mind.”  The ‘city of the mind’ is formed by family life and background, play, religion, social class, gender, education, childhood holidays, and the history and cultural life of one’s home country.All these and other germinal influences are deeply engrained in the pysche and can never be erased or acquired at a later date.Therefore, whilst it is possible to belatedly absorb the dominant aesthetics or concerns of a place or a group, or to “respond to changing perceptions of meaning and relevance in art,”  there is really no escaping where you came from. Marie Soffe is a recent graduate in Fine Art and History of Art from NCAD; this text was written in late 2008. Recently, artist Bryan Duffy has adopted the name Vukasin Nedeljkovic, with the original Nedeljkovic's agreement, in solidarity with him and to generate discussion and awareness of the plight of asylum seekers in Ireland.